VanDerhei also is told that they can receive around $100 for each “specimen,” and remarks that people can make “a fair amount of income” through this. Vanessa Russo, Compliance Program Administrator for Planned Parenthood Keystone in Pennsylvania, is also featured, calling the selling of aborted babies’ body parts a “valid exchange,” despite the fact that purchases of human fetal tissue is a felony. And Cullins talks about the need to keep their illegal activity quiet, saying that it could “destroy” the organization. Live Action President Lila Rose condemned Planned Parenthood’s illicit activities. The newest video by Center for Medical Progress shows at what length Planned Parenthood executives will go to cover up the illegal harvesting of and profiting from baby parts. Multiple executives also discuss the public relations nightmare should these illegal practices become public. The nightmare is a reality, and along with continuing its multiple investigations into the abortion giant, Congress should immediately stop funneling over half a billion taxpayer dollars into Planned Parenthood and instead redirect the money to the over 13,000 community health centers that provide comprehensive healthcare to women. American taxpayers must not be forced to fund Planned Parenthood’s abortion empire and its many abuses, including the illegal profiting from the sale of baby body parts and the horrific practice of allowing infants that are born alive to die so their organs can be harvested. Congress should also ignore the several discredited claims Planned Parenthood’s president has made in her attempt to cover up these abuses. Previous videos have exposed how Planned Parenthood breaks the law by selling body parts of aborted preborn children. Undercover videos also show the behind-the-scenes between tissue procurement companies that partner with Planned Parenthood in this grisly business. Since the release of The Center for Medical Progress videos, Planned Parenthood has been under the scrutiny of state and federal authorities. Congress has opened several investigations into Planned Parenthood’s sale of baby parts, and 13 states have announced separate investigations. The Department of Justice also promised to review the videos and investigate the abortion giant. The House of Representatives is poised to vote this week to halt funding to Planned Parenthood for one year; and several states, including Louisiana, Utah, Alabama, and Arkansas, have moved to defund the abortion giant. 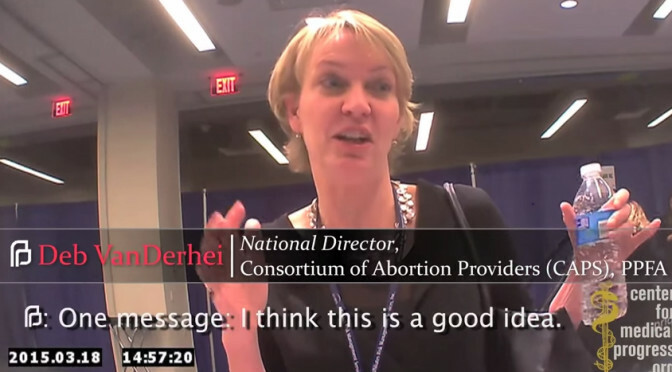 Each new video builds mounting evidence against Planned Parenthood’s trafficking of fetal body parts. In the wake of the undercover videos, pro-lifers mustered the largest protest ever against the abortion giant, with rallies at over 300 Planned Parenthood facilities.